Andressa Da Silva came to us from Brazil in an unusual way, selected in a special competition organized through the American consulate, the American Chamber of Commerce and Bridge. She is currently in the ninth week of her ten-week program and is making the most out of every single moment of this experience. Andressa has a positive attitude, magnetic personality and an amazing aptitude for learning English. I feel so lucky to have met this tremendous young woman and will be so sad to see her go. I invite you to learn more about her unique story below. Amy: Tell me how you learned about Bridge. Andressa: So, in Brazil I studied English at my job. The American consulate has a partnership with an English school called IBEU and I studied for 6 months in this course. At the end of the program, my classmates and I found out that Bridge had a scholarship for one student. Eight co-workers and classmates competed for this scholarship. We had an interview with Monica (from BridgeBrazil), the American consulate and the Director of the IBEU school and I won! I was so happy about this. I always wanted to know the United States, the culture, the people and to learn English. I really wanted to learn English so I studied hard. In those six months, I always got 100% on my tests. Amy: Why did you want to learn English? Andressa: I studied tourism in Brazil, so speaking English is an obligation. It’s necessary for me to get a better job. The principle language is English – it’s the universal language. Next year, my country has the World Cup and then there is the Olympic Games and so there are a lot of opportunities for jobs. If you speak another language, you can work with these events. It’s so important. Amy: What is it like living with an American host family? Andressa: I love it! I love my host mother. I’ll never forget her because she’s amazing. She’s like a mother to me. Everyday she takes me places, like to Castle Rock, Loveland or Breckenridge. Last Saturday she asked me – “What do you want to do today?” I said “Shopping.” She said “Shopping? No! You bought many things. You have to make memories, not only buy pants. You can buy pants in your country. You need to make memories and know new places.” I asked what she recommended and she took me indoor sky-diving! She really skydives…I could never have the courage for this! Amy: What do you think about Denver, Colorado? Andressa: It’s a friendly city. The people are so friendly. Before I arrived in Denver, I had a meeting with the American consulate in Rio De Janeiro with the Cultural Director. She said that American people don’t like to touch, like space and that I should watch first and then do the same. When I arrived here it was so different. All of the people here are so friendly and helped me – the people at Bridge, Dee, the people on the street and on the bus. My first day, I took two buses and I was scared. I asked the bus driver where my street was and he said he didn’t know. I thought “Oh, gosh!” One guy said no problem and he helped me. All the people here are so friendly. At the condominium where I live, everyone talks to me and says goodbye and good morning. I think Colorado is different because I hear stories about people who stay in New York where people are running, the streets are crowded and nobody talks but here it’s different. I love this place. Amy: What surprises you most about American culture? Andressa: I think the people here are more independent than Brazilian people. I like this because in Brazil the kids live with their parents until they are 21 or 22. Here, all the daughters and sons live without their parents at 17. I think the people here are more prepared to live alone and kids learn to do things alone. It’s so different. All of the culture is different…the food is so different…everything is different but I like it. I always tell Dee that I think I’m American, not Brazilian, because I love this place and this culture. Amy: Tell me about the friends you have met here at Bridge and in Denver. Andressa: Many! I’m talkative. I make friends easily. I met many Brazilian friends. I met one girl named Ana Paula who has lived here five years because she’s married. I met her on the bus my first week. I’ve also met many friends here from many countries. My classmates are from Chile, Venezuela, Japan, Qatar, Saudi Arabia, South Korea, Russia- different cultures and different people. I love all my classmates. Amy: What do you think about Bridge? Andressa: It’s amazing. My first week, I thought it was so difficult because in Brazil the classes aren’t in English. My first day here, I couldn’t believe it was English all the time and there were many things I didn’t understand. I thought “How am I going to survive here?” But the teachers are so flexible and so friendly and help all the students. If you don’t understand, they explain again and again. I think it took two or three weeks to totally adapt. I love all the teachers. My favorite teacher is Nick because he’s the best in grammar but all the teachers are good. Shauna is the best in reading. I like the rotation of teachers. Everyday, there’s a new teacher and you can learn different accents and different teaching styles. It’s easy to learn. Here at Bridge, everyone is so friendly – the staff, the teachers, Colleen, Alyssa. They help not only me but all the students. Amy: What activities have you taken part in? Andressa: At Bridge, I went ice-skating for my first activity with five girls from Saudi Arabia and they talked to each other in Arabic. I said “Hi I’m here. Talk to me please!” and one student talked to me. I went to the stock show, the ladies’ night, and Dave & Buster’s for the SuperBowl party. With my host family, I went to Nebraska in December. 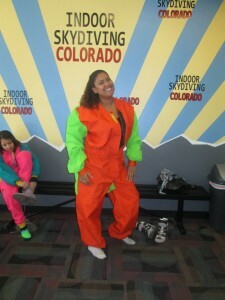 I went to Breckenridge, the cinema, concerts, dinners, lunch, many restaurants, and to Sky Adventures (indoor sky diving). Dee took me all over Denver. To all the malls – Park Meadows, Cherry Creek, TJ Max, Ross, Target…I love shopping! Amy: What has been your favorite thing to do here? Andressa: I’ve never been skiing but I think this will be my favorite because there is no snow in my country. I’m fascinated by skiing. I will go for the first time this weekend. Amy: What is the biggest challenge of studying abroad? Andressa: I try to figure things out alone. Dee always says “You’re American.” When she traveled to Georgia, I stayed alone and survived. I can take the bus alone. I can go many places alone. It’s good because I’m talkative. I’m not shy. Now, I read a book every week to improve my English and learn new words. Last week, I went to the cinema two times to watch movies without subtitles. Amy: You have two adorable kids and a husband at home. How do you deal with being so far from your family? Andressa: Before I arrived in Denver, I thought it would be so hard for me but I love this place and the people here. I talk to my family every night on Skype and it’s not too hard. I have discovered new things, people and another life. It’s amazing to live here and meet these people. Two months without my family is not hard because I have a good life and good people here. This is a good opportunity for my life. When you like what you’re doing the other things are important but…I don’t know how to describe it. Of course I miss my family but this time is so amazing. Amy: Do you feel like your English has improved? Andressa: Yes! Yesterday, Dee’s daughter in law talked about this. I first met her at Christmas. She said “Wow, your English has improved so much.” I talked to her for one hour and I could understand everything and she could understand everything. I think it’s because here I speak English all of the time. When I studied in Brazil, I had only two hours per week. The teacher spoke Portuguese and translated for me when I couldn’t understand. In Brazil, I thought in Portuguese and translated to English. Here, I think in English because I speak English all of the time and listen all of the time. It’s easier for me. Of course there are some words I don’t know or grammar I don’t know but I can understand the context. I can speak and the people understand me. Sometimes students don’t think about the importance of learning other cultures and languages. They play games and talk on the phone. For me, this is the most important opportunity for me. I can go back to Brazil without going to the zoo but I can’t go back to Brazil without speaking English because I’m here to learn. I don’t know when I’ll have another opportunity like this. I prefer to study first and do my homework before going out because I’m here to learn. I don’t know if I can come back in five years for vacation but now I need to learn. Amy: This is your last week here. How do you feel? Andressa: So sad. I can’t believe it’s gone so fast. Dee thinks if I had two more months here I’d be fluent. I’ll never forget this time here. All the people, all my friends…I’ll never forget. I think this is the most important experience of my life. Amy: What will you miss most from this experience? Andressa: Everything. All the people. All the friends. Everything. I think I need to return to this place because I love this place. Amy: What’s the first thing you will do when you get home? Andressa: I think, eat. Rice and black beans…real because here its not real rice and black beans. At Christmas here I ate soup. I’ve never had soup at Christmas. At my house, we have a big meal at Christmas. This has been the most difficult thing for me, not distance. I think it’s food! At first I thought “How am I going to survive without rice and beans and meat everyday?” But yesterday I told Dee that I think I’m American now because I can eat this food. It’s amazing. I’ll never forget this time here. Amy: I feel so fortunate to have one more week to spend with you and will miss you very much. Andressa: Thanks to you and all the staff at Bridge. All the time when I needed help, people were so friendly to me. I love all the people here. About Us, Culture Shock, Denver, Colorado, esl-blog, Extracurricular Activities, Food and Drink, Meet our students!, Our Schools, Programs, The ESL Classroom Colorado, Colorado attractions, Denver, Denver attractions, ESL classes, ESL students, esl-blog, learn English in the US, learning a language, study English in Colorado. permalink.